Roe v. Wade is a dramatization of the historic court battle that resulted in the legalization of abortion in the US, starring Stacey Dash of Clueless fame and famous actor, Jon Voight. 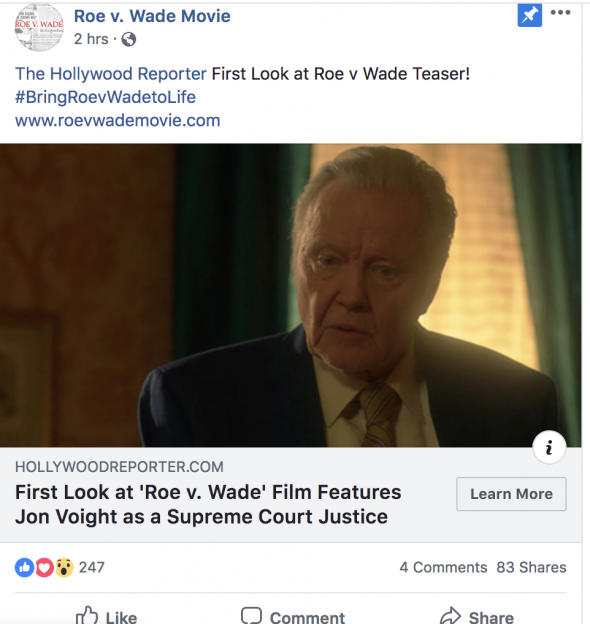 Breitbart reports that filmmakers Nick Loeb and Cathy Allyn attempted to post an advert on Facebook linking to an article by the Hollywood Reporter on the movie and featuring the hashtag #BringRoevWadeToLife. The new rules apply to ads of a political nature and require additional information from Facebook users to verify their identification as well as who paid for the ads before they are approved. “Transparency continues to be a major priority for us in order to prevent election interference, so we are taking a broad approach to start as we roll out this policy further,” Facebook’s statement read. The film’s YouTube page has also faced issues, being demonetized for “invalid activity” on their AdSense account, an issue which the producers say they have no knowledge of. The film is still raising money for its release at www.RoevWade.com.